Note from shop owner Hi all! The shop will be open again in mid-May to answer enquiries & orders. Hi all! The shop will be open again in mid-May to answer enquiries & orders. I absolutely love this painting so very much. This painting is gorgeous. I wish I could give it a hundred starts. Thank you Katie! I work from my bright and airy studio which looks over the countryside. It provides a peaceful environment for me to paint and experiment with different artist materials. I gain inspiration from nature, colours and all the beauty in the world. My paintings are bright, colourful and have often been described as dreamy. 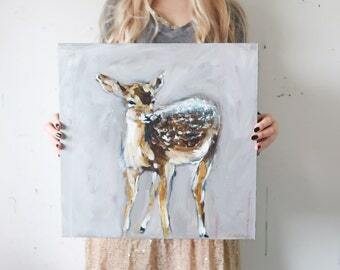 I also create custom paintings to suit certain colour schemes & rooms, so you can message me or email me at shop [!at] katiejobling.com for more information. My work is not rigidly planned out, rather, it is created spontaneously, which keeps it fluid and creatively free. I love the idea of being free-flowing and full of opportunities. Email me at shop@katiejobling.com for any enquiries. Thank you for having a look at my artwork. If you have any questions or queries feel free to contact me. I am happy to accept payment through PayPal (for which you do not need a PayPal Account) and credit/debit card. Any bought items will not be shipped until payments have cleared. If you are experiencing problems with payment, contact me and we may be able to sort something out. Please pay within the 'Etsy rule' of 3 days, that way I can ship your product out to you as quickly as possible. Items will be packaged very well and thoroughly protected, including bubble wrap and cardboard. Usually a lot of my packaging will be recycled. I use Royal Mail as I am based in the UK. Depending on the item I may be able to ensure that it goes same day, 24 hour or signed for etc (please contact me for this). If you need something urgently, please contact me before you buy the item to see if this is possible. If paying by PayPal, I will send item to the delivery address stated at the Etsy checkout, not the PayPal account. Please note: If the item is being shipped overseas, there is a very slim chance that it can be kept in customs for up to 6 weeks. Please understand that this is a risk with all packages coming out of the UK, and should not be a problem. Please contact me if there is any more information you require. If you have a specific requirement or the item has been bought as a gift, let me know. Prints may also be available. If there is a print you would like of any of my artworks, contact me and I will arrange for it to be created.